The team of "Tatto Salbe" are young and creative people, with the spirit to change the course of things, and the dream for the alternative to become the mainstream. They understand the world in a much simpler way then it’s currently known and this is Rule Number One when they design their products. Nature is their playground, and there they find the simplest answers to the hardest questions. There they found the answer for Tattoo Salbe too! 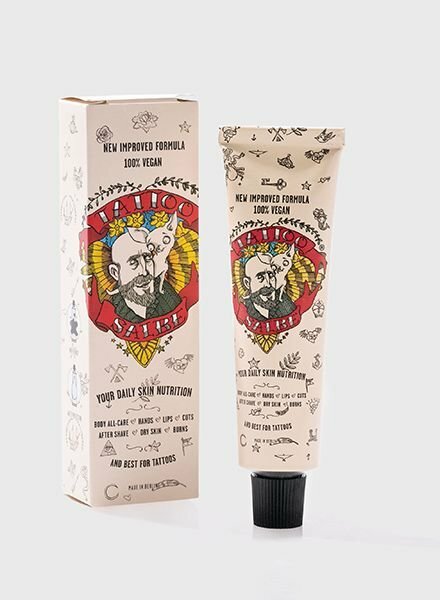 The universe gave birth to the all-natural Tattoo Salbe balm when a man and his best friend Diego, a Chihuahua, travelled the world. Diego, amongst smallest of the dogs, lived his life in the belief that he was much bigger and stronger than he actually was. So, one night while protecting his temporary home during travels in India – he encountered a group of local hounds, much larger and stronger then himself. He stood his ground against them, but soon lost his way inside their territory. Duty took Diego away from his master, and best friend that night – but the unconditional love that bound the couple together could not be broken. Since then, anybody who tries out Tattoo Salbe instantly feels the love and deep bonding that’s contained in the balm and its ingredients. The seductive aroma and gentle healing qualities mean the balm is as pure and natural as the unconditional love that bound the man to his best friend! Tattoo Salbe treats your skin and tattoos with the power of love. Made in Berlin with heart!